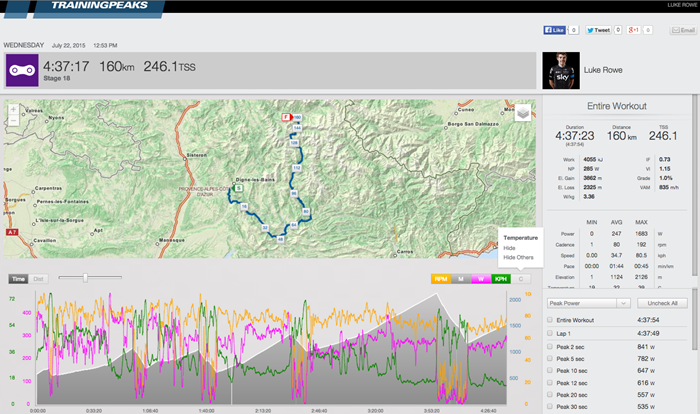 Rowe’s Peak 1 Hour Power came in the very first hour of racing when he averaged 280 watts. 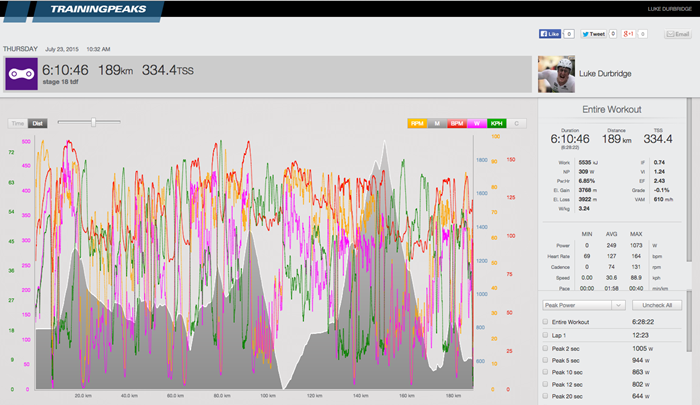 His Peak 30 Minute Power came on the third climb of the day and he pushed 316 watts, or 4.30w/kg. Over the full stage, Rowe averaged 247 watts and 34.7km/h. View Durbridge’s full SRM power data. 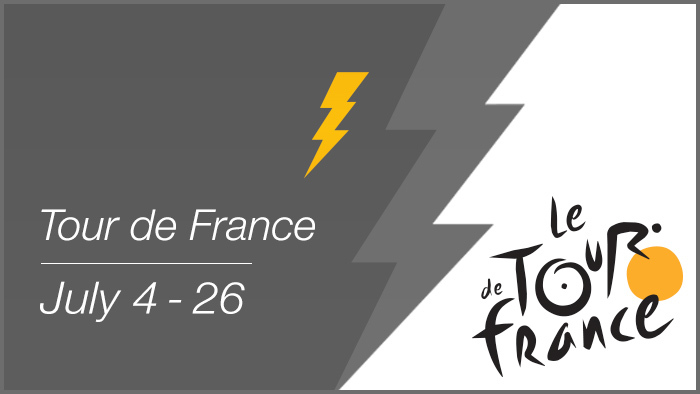 Another fast start, Durbridge set his Peak 20 Minute Power of 407 watts, or 5.29w/kg, less than 10km into the stage. 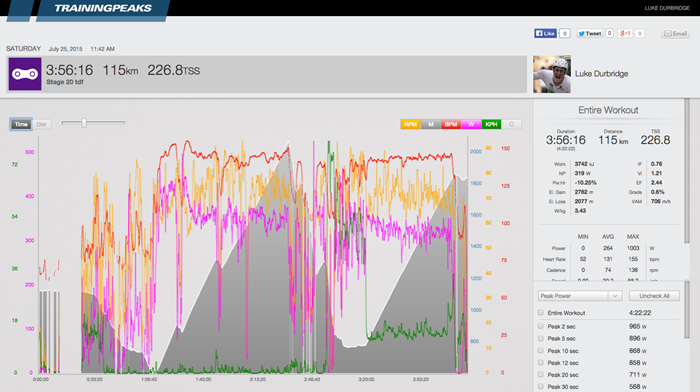 Over his Peak 1 Hour Power of 326 watts, Durbridge averaged 76rpm. Durbridged burned 5535 calories during the stage. Rowe’s Peak 30 Minute Power came from the very start of the stage while riding up the first climb of the day. He averaged 370 watts, or 5.03w/kg and 21.5km/h. 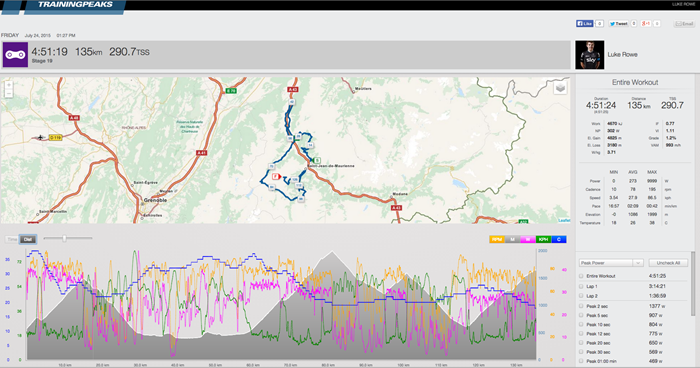 His Peak 1 Hour Power came on his ascent of the Col de la Croix de Fer with an average of 317 watts, or 4.31w/kg. with an average cadence of 75rpm. Rowe’s average power over the full stage was 273 watts and he burned 4670 calories. Climbing the Hors Category Col de la Croix de Fer, Durbridge averaged 345 watts, or 4.49w/kg for 1:05 and averaged 75rpm. Ascending the vaunted Alpe D’ Huez, Durbridge averaged 314 watts, or 4.08w/kg at an average speed of 14.3km/h. Over the entire stage Durbridge averaged 264 watts and burned 3742 calories.